Berwick-upon-Tweed Barracks and Main Guard, to give this place one of its official names (Ravensdowne Barracks is the other) stands on the eastern side of the walled town of Berwick-upon-Tweed, just inside the line of the massive Elizabethan fortifications erected here between 1558 and 1570. There is a pay and display parking available close by. If you are considering visiting, it is worth checking the opening times linked from this page first. Berwick-upon-Tweed has a history of conflict and military occupation second to none within these islands. It changed hands between England and Scotland no fewer than 14 times in the two centuries up to 1482, at which point it became permanently English. This history suggests that the enormous effort expended on building a castle and town walls in the medieval period actually did surprisingly little to deter invading armies from either the north or south, depending on who was in possession at the time. When Queen Elizabeth I came to power she took what were regarded as the necessary steps to ensure that England's control of Berwick-upon-Tweed would never again be challenged. The result was the most expensive building project of her reign: state of the art artillery defences surrounding two thirds of the medieval area of the town. They were never fully completed as originally planned, but were still sufficiently impressive to achieve the desired result, and they remain hugely impressive today. The 1715 Jacobite Uprising intended to put the Stuart dynasty back on the thrones of England, Scotland and Ireland began in Scotland. The age in which Scotland and England might go to war over territory was long gone, but it was obvious that Berwick-upon-Tweed guarded the eastern approach to England by any future Jacobite uprising starting north of the border, and it therefore remained of considerable military importance. Traditionally it had been the norm for troops garrisoning towns to be billeted in houses and inns, with all that implied about discipline and defensive readiness in case of an emergency. The solution, which was highly innovative at the time, was to build barracks in which the troops now needed to guard Berwick-upon-Tweed against the Jacobite threat could live. The project was managed by the Board of Ordnance and approval was given to proceed in 1717. Plans were drawn up by the noted architect Nicholas Hawksmoor, and a site was chosen within the Elizabethan town defences, but slightly removed from the main built up area of Berwick-upon-Tweed itself. Work quickly got under way, under the supervision of a military engineer appointed by the Board of Ordnance, Captain Thomas Phillips. It would be fair to say that the barracks that emerged, though recognisably based on surviving plans drawn by Hawksmoor, were in places simplified and shorn of some of the more flamboyant detailing. You can almost hear Captain Phillips concluding that it was a barracks he was building, not a palace, and he was doubtless operating under tight budgetary constraints imposed by his masters at the Board of Ordnance. What was in place when the army took up residence in 1721 was a barracks comprising two parallel accommodation blocks. These were the main blocks you see today, which between them were capable of accommodating 600 men and 36 officers. The officers would have had single or twin rooms, depending on rank, but the other ranks would have slept eight to a room in large beds intended to accommodate two men each. As originally built there was no sanitation or water in the barracks, and all water had to be drawn from a common source. Cooking took place in individual barrack rooms. The Clock Block, which today encloses the southern end of the barracks, was built between 1739 and 1741 in place of an earlier, smaller building. It was originally used as storage space before becoming the Regimental Institute, providing recreational facilities for the men of the Kings Own Scottish Borderers in the late 1800s. In 1745 a military hospital was built a short distance to the south of the barracks, and in 1901 a gymnasium was built behind the eastern accommodation block. The main gate, recognisably to Hawksmoor's design albeit in simplified form, originally stood in the middle of a plain length of wall. A single storey building was later added to the eastern side of this to provide an officers' mess, while a guardhouse was built to the western side of the gate, intended to control all access to and from the barracks. 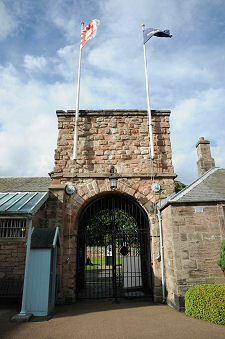 After the 1745 Jacobite uprising had failed, Ravensdowne Barracks continued to house a military garrison, though usually in numbers far below its capacity, and often formed of troops considered unfit for service abroad. This seems to have remained the case even during the period of the perceived threat from Napoleon. Britain cut back on its defences after 1815, and Ravensdowne Barracks were effectively abandoned until the 1850s, when small numbers of troops once again took up residence. 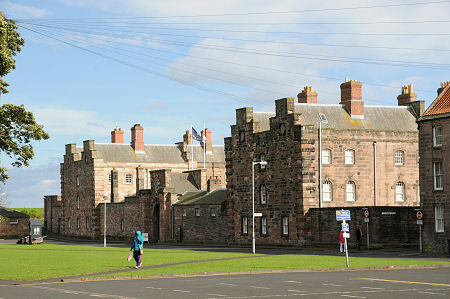 In 1881 the barracks became the headquarters and depot of the King's Own Borderers, which became the King's Own Scottish Borderers (KOSB) in 1887. Various changes and updates were made to the accommodation over time. During World War II the barracks were supplemented by a large training camp on land to the north of the town walls. 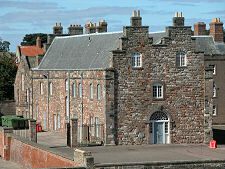 The barracks remained the depot of the King's Own Scottish Borderers until 1963. It has since served as the base for a unit of the Territorial Army, but no regular units remain. 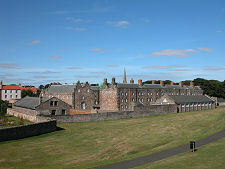 Ravensdowne Barracks is now cared for by English Heritage, and a visit is an essential part of any tour of Berwick-upon-Tweed's defences. The barracks are also home to no fewer than three different museums. These are the King's Own Scottish Borderers Regimental Museum in the northern end of the eastern accommodation block; an English Heritage exhibition, "By Beat of Drum", celebrating the role of the infantry in the British Army over the centuries in the southern end of the eastern accommodation block; and the Berwick Borough Museum in the Clock Block. The barracks are also home to the Berwick Gymnasium Art Gallery in, as the name implies, the gymnasium. What is nice about the three museums on site is the contrast between them, both in content and style, which helps avoid any "museum overload". The KOSB Museum tells the story of the regiment from its foundation in the early 1800s to its amalgamation with the The Royal Scots on 1 August 2006, subsequently becoming the 1st Battalion Royal Regiment of Scotland. The museum is nicely laid out and fairly extensive, with exhibits ranging from recreated WWI trenches to collections of medals, uniforms and arms. By Beat of Drum takes a broader historical perspective of the role of the infantry in the British Army, starting in the era before the regular army, and moving on through a series of key historical moments, including the Restoration, the war in North America and World War I. We were especially impressed by the "parade" of (we think) over a thousand small figures representing the 25th Regiment of Foot in the 1780s. 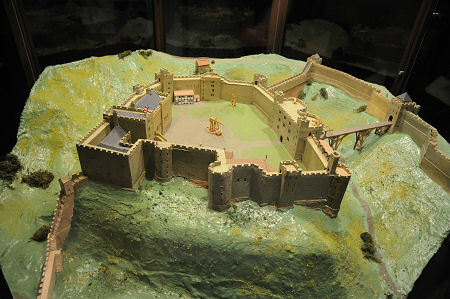 The Berwick Borough Museum is very different from the other two, being non-military in its focus (despite having a magnificent model of Berwick Castle in its heyday), and adopting a number of different approaches to telling the story of the town. 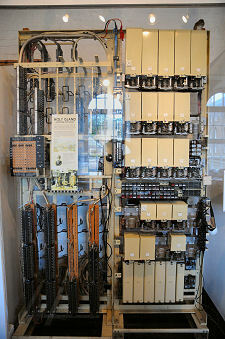 When we visited part of the museum was given over to objects loaned by the Burrell Collection, while elsewhere there was a display case containing the telephone exchange used between 1973 and 1995 on the Holy Island of Lindisfarne.